I am very pleased to announce that Walkers crisps are again running their competition to find a new favourite flavour for the nation. They have chosen six exciting varieties, available now in the shops, for us to choose between and pick a favourite. Each of these six flavours was put forward by a member of the public on the Walkers website.I will be covering all the flavours over the next week or so thanks to the lovely folks a Walkers who sent me a sampling set. First up we have Robert’s Ranch Raccoon, yes raccoon. I’m not sure who Rober tis, but he certainly has interesting tastebuds. Even as a seasoned food taster I have no idea what raccoon should taste like, so was going out on a bit of a limb here. The flavour sounds quite innovative and reminds me of the quirky flavour that appeared last time Walkers ran a competition of this sort, Cajun Squirrel. I opened up the bag and the aroma reminded me of chicken, curiously enough. I tucked in and the flavour had a creamy aftertaste, that of sour cream and chive, but at the forefront was this meaty flavour. It tasted somewhere between pork and chicken, and was quite overpowering. I honestly couldn’t quite place the meat, and I found the flavour very meaty, almost disturbingly meaty given the name. It is a weird idea for a flavour and they certainly managed to make them taste like something different, but the concept just doesn’t appeal to me, and the flavour made me feel a bit sick. Not because of the taste, in a different context these would seem quite pleasant, but the word racoon makes me think of some strange road kill in America. Eek. If only someone had told me they were chicken dippers with sour cream dip, but once an image is stuck in my head it won’t go away. Think I’m looking forward to trying the other flavours more, but this is the weird one done at least. They are in fact suitable for vegetarians. I thought it tasted like fish. You know, some breadcrumb-covered frozen fish you can pick up at the supermarket. Nice initially, then this strange after taste, like I'd bitten through to the marrow of a cooked chicken bone. Tried it today was ok. I guess Ranch Dressing would more fit the bill. Tried these crisps today, only managed 3, not a nice taste, really didn't like them, certainly won't be buying anymore of this flavour, yuk. Definitely the weakest of the bunch - I liked ALL the other flavours though. all the flavours are rank, god knows who picks these flavours ! If I wanted beans in toast I would atually have beac on toast ! Ranch dressing is not relevant to these crisps because ranch dressing does not contain sour cream it is made with a base of buttermilk. It tastes like wet sheep x vomit. It's really awful and foul tasting. Who approved this flavour should have their taste buds re-checked. Please don't put this into mass production. Major fail - walkers. I guess you needed one that wasn't going to be a winner. First crisp maybe, second different then third I feel sick! 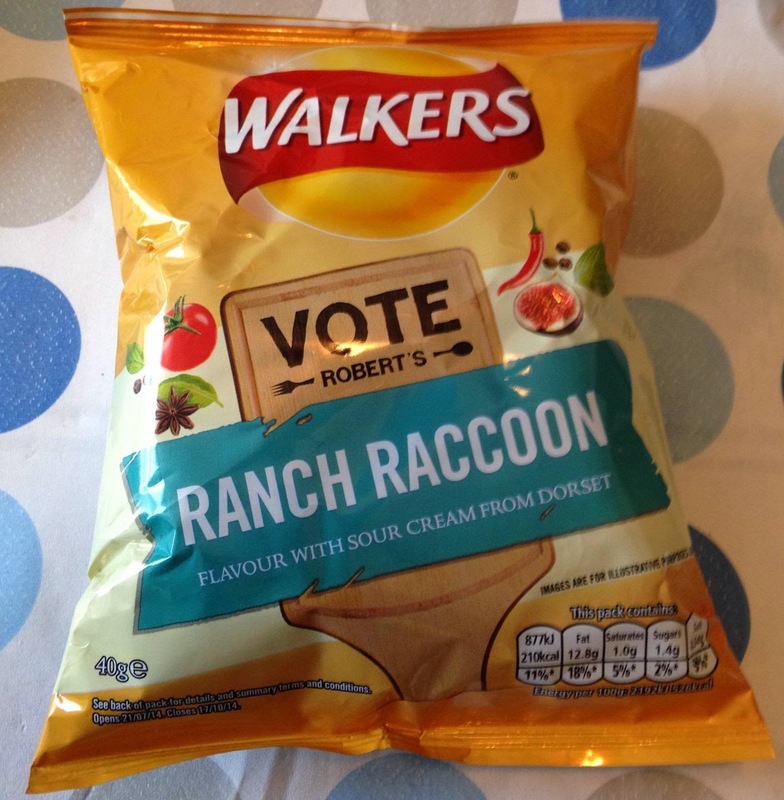 I do love flavour of all kinds but Ranch Racoon NO!! I love ranch racoon, really nice! No idea what everyone is going on about. Though we all have different tastes I guess. My friend in the USA has a pet Racoon. I have been there with him. Hes like a pet house dog. Seriously.. I sent a pic to his mum of ur latest flavour. She said he was traumised... Poor we fella.